The hardness of soap depends on the recipe used and the amount of time it takes to cure. 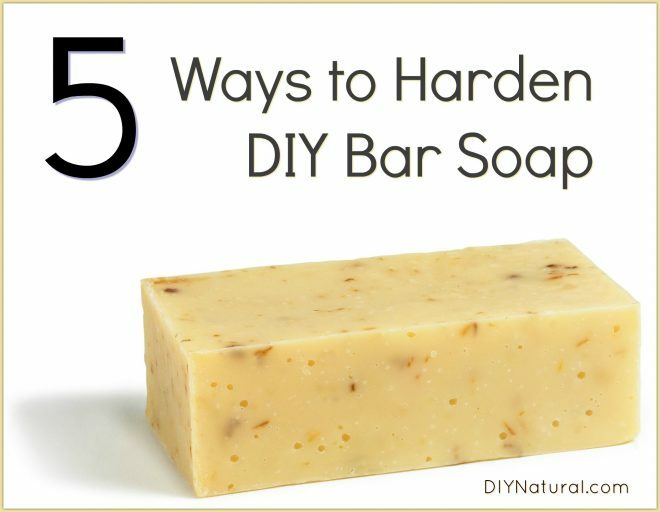 But there are a few things you can do to make your DIY bar soap harder, which in turn helps it last longer. If you have never made soap before, you might want to check out my basic recipe and how weights and volume measurements work when making cold process soap. You can also look at this article on lye, just in case you’re a bit hesitant about using it. After you’ve made a few batches, it’s time to start thinking about how you can improve the process and get a harder, longer-lasting bar. Lye needs to be dissolved in water in order to turn oils into soap. The amount of water you use will make a difference in the cure time and will also affect the outcome of the hardness of the bars. Too much water will cause bars to be soft and take longer to cure. They will also lose a lot of weight during curing, possibly leaving a softer bar. If the recipe calls for 5.75 ounces of water, you can decrease it by around 10%, or use about 5.25 ounces. This will allow your bar to cure much harder. A small amount of beeswax added to the melted oils will help harden your soap. If you’re looking for a vegan alternative you can also try soy wax, bayberry wax or any other type of vegetable wax. You can also try Kokum butter, which is one of the hardest butters known to man. If using my basic recipe, about 3 ounces, melted and added to the oils will do nicely. Don’t wait to add these at trace; they will only harden and lump up, not dispersing in the soap base at all. Sodium lactate is a clear liquid that comes from the natural fermentation of sugars found in things like sugar cane and sugar beets. Used in an amount of about 1%, or roughly four tablespoons (2.25 ounces) for this recipe, sodium lactate will significantly harden your soap. This is especially recommended for individual molds that have an intricate design, as they can sometimes be very tricky to un-mold. Oils in soaps have different qualities. And some oils can’t be substituted for others due to a specific SAP value. Simply put, the SAP value is the amount of lye needed to turn that oil into soap. There’s a lot more to the numbering system, but all you really need to know is that the numbers need to be close to each other in order to exchange them. Coconut oil has a much different SAP value than olive oil and should be left alone in the amount recommended. But olive oil is very close in SAP value to certain other oils. So you could decrease the amount of “other oil” recommended in this recipe and increase the amount of olive oil. The soap will still turn out the same, but the end result will be a harder bar. Like sodium lactate, salt will help harden soap into very hard bars. Add about ½ teaspoon per pound of oil in the recipe. This recipe has 14.25 ounces of oils, so between ¼ and ½ teaspoon of salt will be enough. Stir it into the lye solution well, making sure it is fully dissolved before adding the lye to the oils. Be sure to use pure salt that has no additives; any additives may affect the outcome of the final bars. Have you used one of these methods to make harder soap bars? If so, how did it work? What can you add to melt and pour soap to make the bar harder? I was surprised to see that you add 4 tablespoons of sodium lactate to your recipe. Everything I’ve read says 1 teaspoon per pound of oil. Maybe that’s why sodium lactate made not a bit of difference in my soap! Can you give me the complete reciepe of a beauty soap?Thank you and God bless. Hi Lourdes! You can see the recipe here on DIY Natural if you look up Handmade Natural Soap For Hands and Body. And if you go to How To Make Soap: Weight VS Volume Measurement, also here at DIY Natural, you can see the weights of the measurements that I used. This recipe is the one I use for every bar of soap I make, changing only the additives. What makes the soap lather? Most oils don’t lather much on their own, Delberta. By adding coconut oil to a recipe, you get nice fluffy lather. I use a ratio of between 25-33%. Too much coconut oil in a recipe can cause too much lather, thus drying out your skin as it pulls too much moisture out of it. Incidentally, lather isn’t necessary for soap to work. It’s just a thing that we’re all used to now. Lard that collects on top of beef bone broth (after cooking and cooling bones), makes a very hard soap. It doesn’t lather as well as my coconut oil soap, but it works. I love using lard, Priscilla! In my recipes it makes a nice fluffy lather, but I use it along with coconut oil. I’ll have to try it by itself sometime. They say the tallow that comes from around the organs, like kidneys, makes the hardest soaps. Let’s put it to the test!